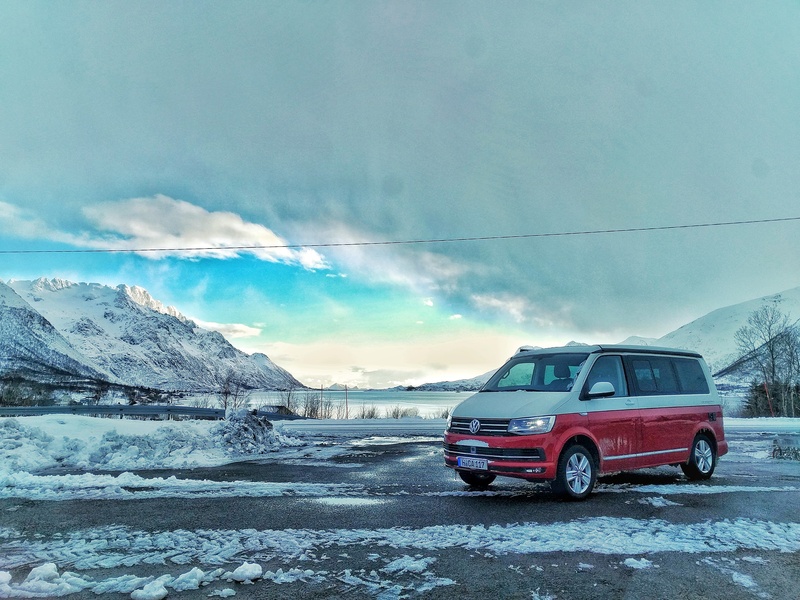 It’s 4pm and, having just passed through Vestpollen, the snowstorms that have been chasing us all day are, for the moment, firmly in the rear-view mirror of our Volkswagen California Ocean. The E10, as we found a moment ago, is still treacherously icy but, for the first time in hours, we’re not peering eyeballs-on-stalks through a semi-frozen windscreen. Instead, conditions are clearing up on the approach to the small village of Laupstad, treating us to the first vestiges of a glorious sunset. As we round the northern end of the Laupstadosen bay, a golden glow erupts over the mountains to our right, bathing the crystalline water and the eastern peaks in the purest Norwegian light. Jaws on the floor, we spend ten minutes parked up, simply staring out to sea as a group of Nordic skiers glide passed on the road behind us. We’re so entranced in this breath-taking landscape that we initially don’t notice the huge grey clouds rolling in over the western mountainside. The snowstorm that we fought so hard to outrun is already back on our tail. It’s time to get moving. For the next 30km, we turn the music up and keep our heads down, focussing on pulling clear of yet another blizzard. 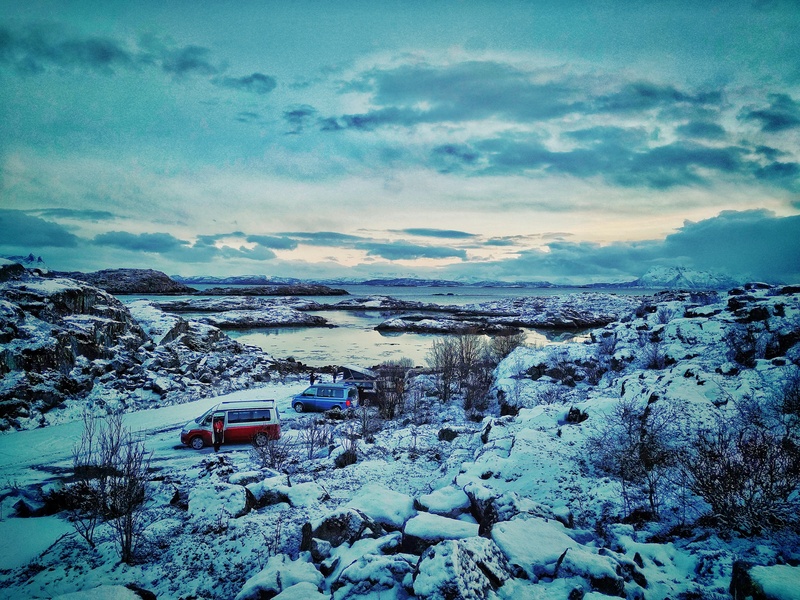 Having spent the best part of the day surrounded by stunning vistas and twisting tarmac, it’s easy to forget what an otherworldly landscape the Lofoten islands provide. 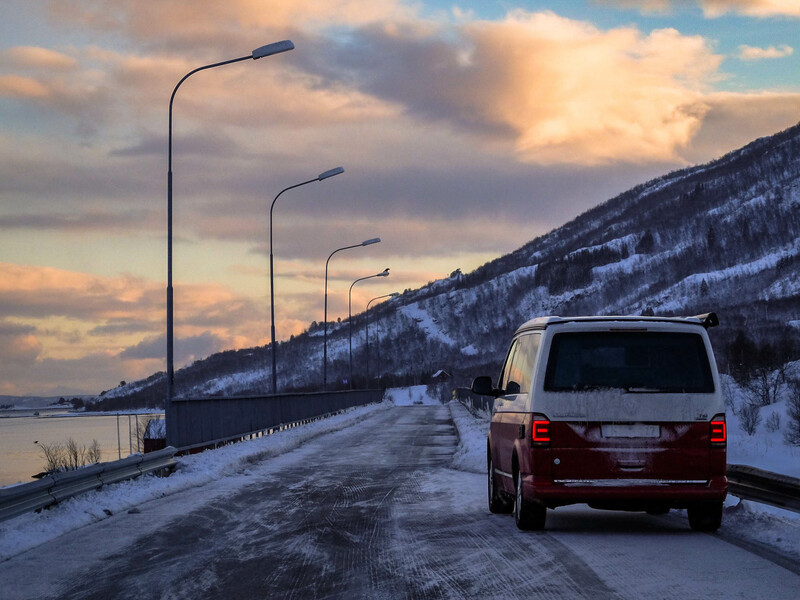 Our increasingly severe case of “mountain blindness” is quickly cured as we traverse the short, low bridge across to Møysalen and are treated to sun-kissed sea views on both sides. Crossing our third island of the day, the mountains are soon looming ominously on our left, the E10 rolling gently through the valley in their shadow. We may have been growing immune to these granite monsters but it’s hard not to be impressed by the sheer magnitude and proximity of the cliff faces thrust into view via the side window. As we found earlier in the day, we are surrounded by pure wildnerness. Tengelford, some 10km back the way we came is one of just a few settlements in the area. Out here, the mountains are our only companions. And soon, they too are disappearing as a new batch of snow clouds rolls into the valley, cloaking us with a dull grey light. Initially it only heightens the etherealness of our view across the narrow stretch of water separating us from the northern half of Møysalen. However, within minutes, the temperature has dropped further below freezing and the first flakes of snow are beginning to fall. Just up the road, any remaining light in the sky is wiped out completely, not by an onslaught of cloud but by the entrance to the Sordal Tunnel. Our journey across the Lofoten has often pitched the California into darkness, the Norwegians making prolific use of tunnels to cross between the various islands (and underneath the great stone giants that dominate the landscape). Some, like the one we sheltered in the previous night, seem to be chunked straight out of the rock, as if by a wild beast, while others are more regimented, lined with the sodium glow of lamps and small laybys. The Sordal Tunnel falls firmly into the latter camp. 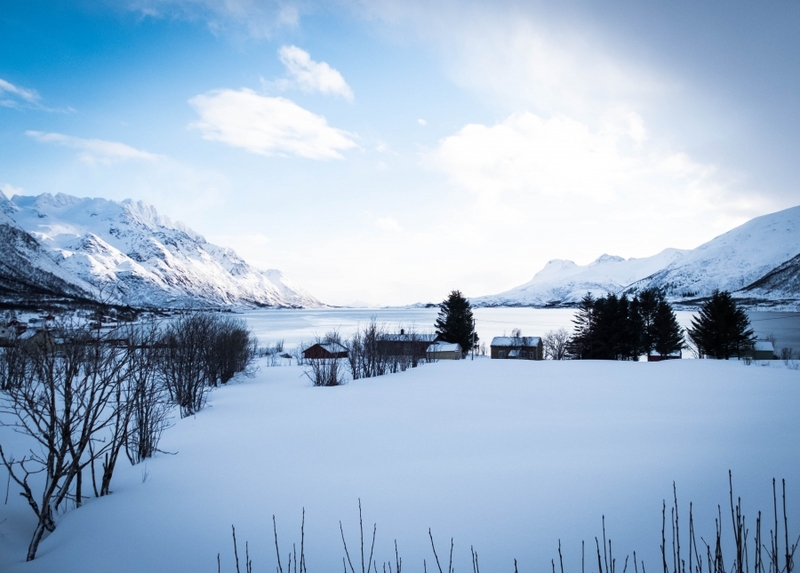 At 6.4 kilometres, it is the longest tunnel in all of Lofoten. 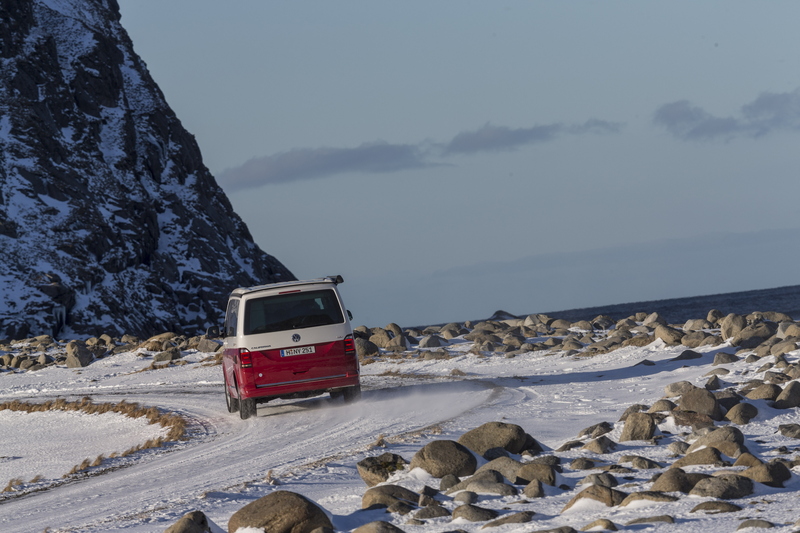 Driving the VW California through it is unlike anything else. Inside we seem to lose track of all time and distance. Only a gentle curve at about two-thirds distance breaks us out of a trance-like state. Finally spat out towards the light at the other end, it feels like we’ve travelled for hours in the darkness. A change in the weather further convinces our body clocks that we’ve been in the tunnel for more than five minutes. 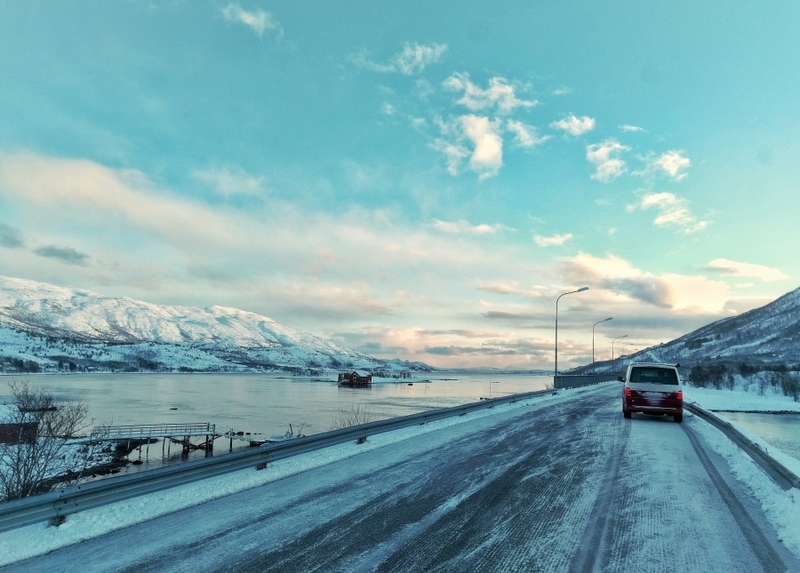 Mountains still dominate the horizon, and the roads are fresh with snow, yet the skies are crystal clear. The blizzards of earlier suddenly seem a distant memory. 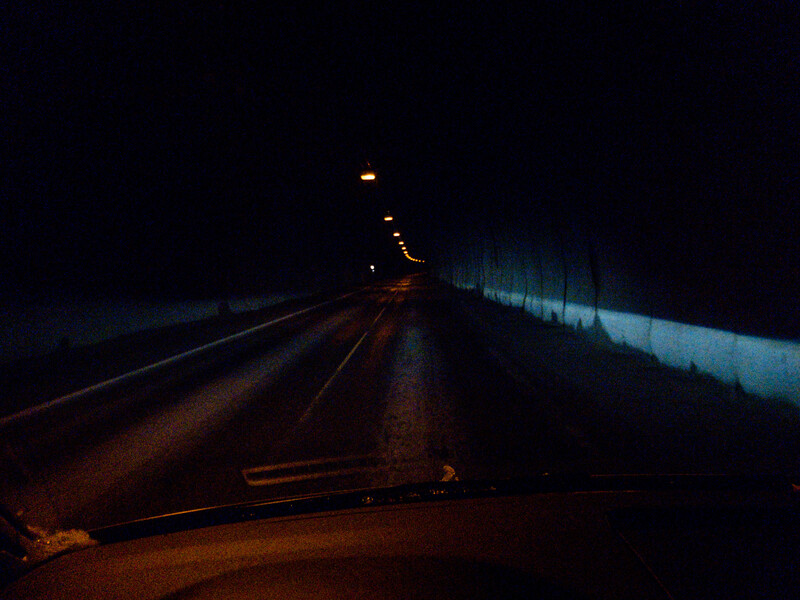 Cruising through the tunnel’s hypnotising darkness provides us with a newfound respect for the Norwegian topography too. 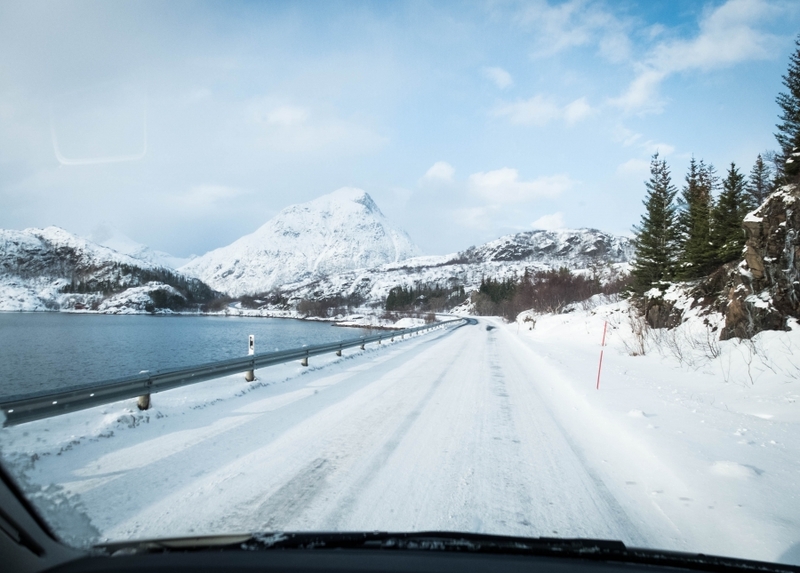 While most Alpine roads will switch this way and that in an effort to ascend the slopes, Norway respects the power of the mountains by choosing to head underneath the often-inhospitable landscape. It’s a country governed by its geography, topography and meteorology and, with the roads designed the way they are it means you are constantly looking up with awe at the peaks, rather than using them as a vantage point for panoramic vistas. The result is that, cruising along in the California, we suddenly feel rather humbled. The mountains are gods around here and we, the mere disciples, can only be left to stare skyward with complete reverence. 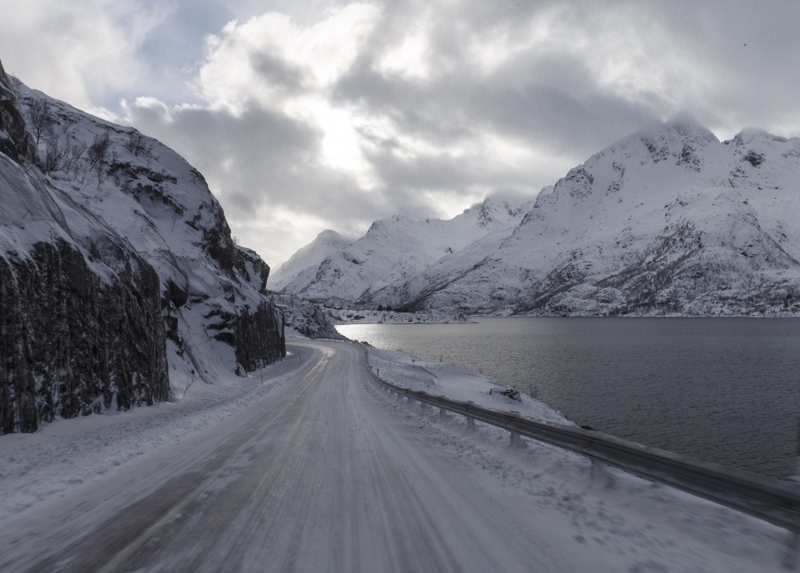 At Gullesfjord, we are as far north as our Arctic road trip will take us; 68.53 degrees above the equator. We’re wrapped up warm but the California is feeling it too. The ice and snow is beginning to build up in the wheel arches and the onboard thermometer has suddenly plummeted to minus six. Now heading south, the temperature takes its time to warm up and, by the time we pull off the E10 at Austre Kanstad, it’s a totally tropical minus four-and-a-half degree Celsius. It’s obviously been cold here for a while too. The northern half of the Innerfjorden is frozen solid, the frigid waters imprisoned by a thick layer of sheer white ice. The light at Laupstad had teased a truly spectacular sunset and, at Kanstad, the sky finally erupts with colour. Arctic azure mixes with vivid pinks and oranges. The California is parked up by the side of the road and the silence is only punctuated by the staccato shutter click of our camera. “This is too good to miss,” we think, while also trying to take some time to soak it all in without staring through a viewfinder. Unlike the E10, the 837 is narrow, often ditch-lined and coated in a fairly thick layer of dusty snow. It also twists violently, waiting to catch out the unwary. Even at the sedate pace prescribed by the California it requires our unrelenting attention. However, as we approach the southernmost tip of Hinnøya (our fourth island of the day and location of tonight’s wild camping adventure), our eyes are suddenly drawn off the road. 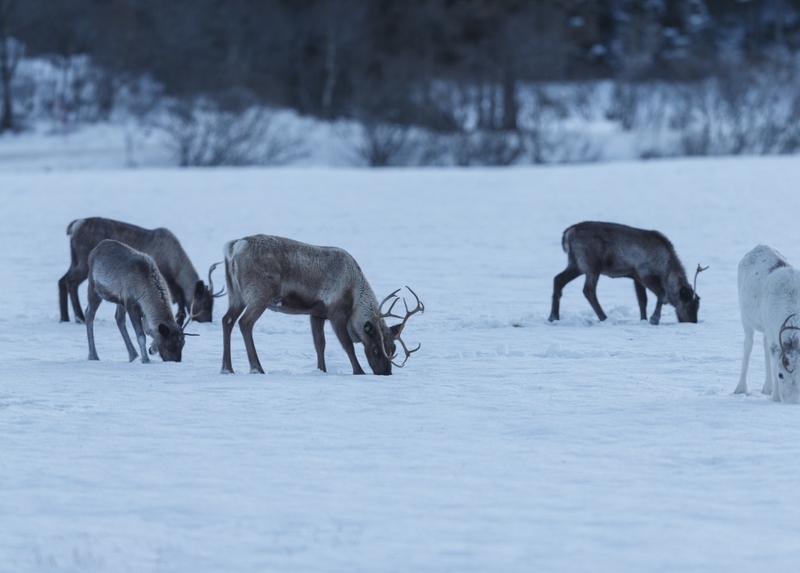 In a frozen field to our right, a herd of reindeer are going about their business, nuzzling into the snow to try and get to the hardy grasses underneath. Does it get any more stereotypical Arctic than this? A few kilometres further on and we’re parking up on the still shores of Offersøy. After an immense day of travel, the California is finally allowed to rest, as we jump into action setting camp for the night. 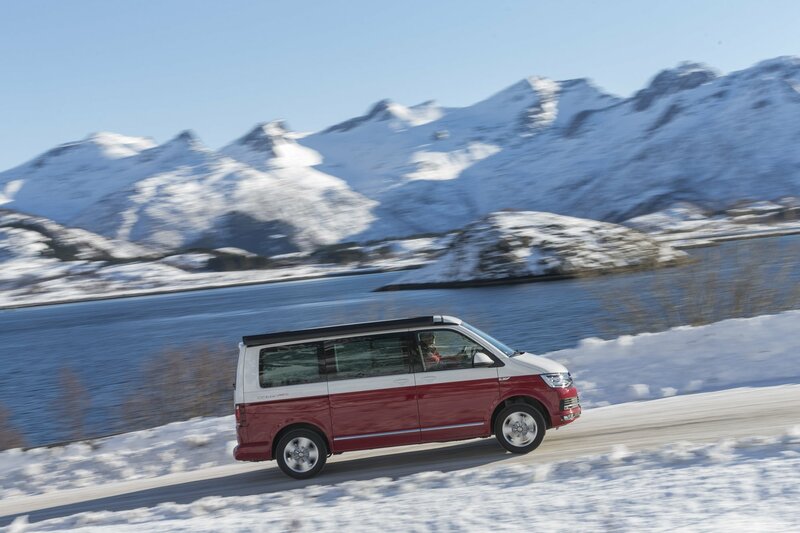 Thankfully, Volkswagen’s iconic camper is like a Swiss Army knife designed by IKEA. Everything is incredibly intuitive and easy to put together. Tonight we’ve decided to sleep ‘upstairs’ in the roof-mounted pod; a few moments later, after a push of the button, our sleeping quarters have risen up, electrically unfolded by a number of near-silent motors. Unzipping a compartment in the tailgate gives access to a couple of folding chairs, while a small table is sneakily hidden away in the sliding door. In less than ten minutes everything – including the awning off the side – is set up for the evening. Before heading over to the nearby hostel for dinner, we take a few minutes to soak it all in. The van. The drive. The location. Everything has been greater than our wildest expectations. Only one thing has been missing and, after a dinner that features our line caught cod in both the starter and main courses, the final piece of the Nordic puzzle slots into place. 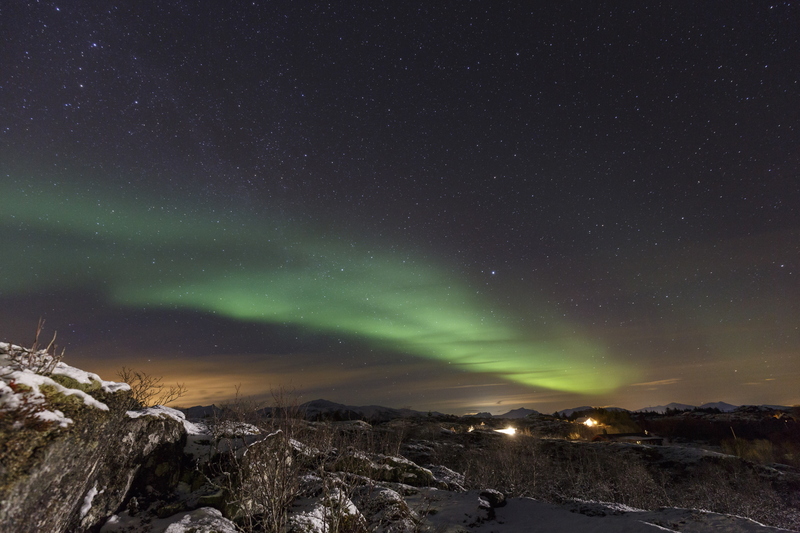 To the north, over the dim silhouette of the surrounding hills, a green glow emerges among the stars. Over the course of the next ten minutes, this lime luminosity grows in both size and intensity. The Northern Lights have arrived, providing a magical climax to what has been an unforgettable Arctic adventure.